If you’re like us at Glamour Flooring LA, we know you’re always looking for some great ideas to make your home more unique and stylish. 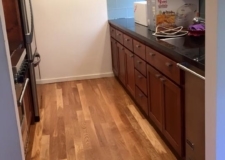 We’ve found out that flooring materials don’t always have to go on the floor! You can use them to create beautiful wall features that will make your home unique and that are very budget-friendly. Paint is boring and wallpaper is messy. Why not go a different way and try to use laminate floors on your walls? You can give your walls some interesting texture and a unique look by playing with the installation of laminate flooring material. Vertically, horizontally or even diagonally, laminate can be installed any way you want and give a wall that extra special touch. Professional tip: you don’t want to overpower the room so it’s usually a good idea to pick one wall to install laminate planks on. It will give a focal point to the whole space without feeling like the walls are closing in on you and making the room smaller. Contemporary Family Room by Newport Beach Home Builders Christiano Homes, Inc.
Take your bedroom to the next level with an amazing, hand-made headboard for your bed. Instead of buying a prefabricated one, you can give your room a great look by making your own headboard by installing hardwood flooring planks on the wall right behind your bed. Not only will it save you the cost of buying a whole bedroom set but you’ll avoid a matchy matchy design and bring some flair to your room. A wood-paneled wall can easily double as a headboard. Dark hardwood flooring can be a great choice for small rooms like dens. 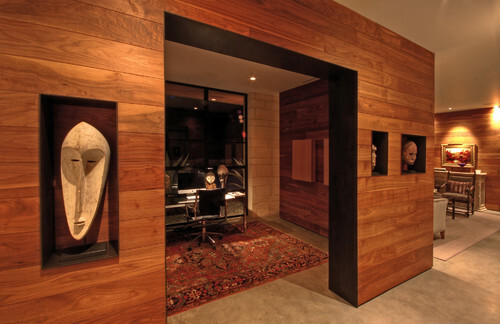 You want the space to be cozy, warm and elegant, and dark solid wood panels will give it exactly that feel. 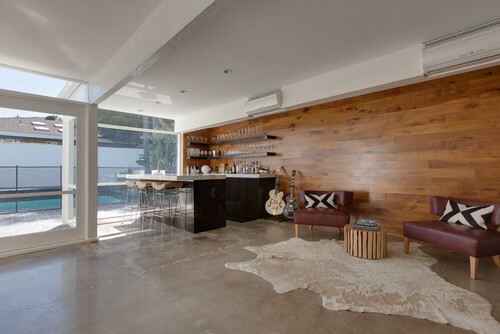 To bring the whole room together, go all out with all-wood walls. Professional tip: when used on all walls, especially in a dark shade, wood have the tendency to make the room look smaller. Go with bright and light furniture to balance the richness of the hardwood. Or if you’re looking for a more masculine feel, run with it and decorate with strong pieces like leather chairs, deer heads and a modern bookshelves. There are so many different types of flooring materials you can play with, it’s hard to even pick one. If you’ve got a creative mind and little bit of DIY skills, flooring tiles or wood can be a great starting point for a wall art piece. For example, you can get a great set of mosaic floor tiles to create a decorative wall piece. Cut the tiles in pieces of different sizes and shapes to add some texture and frame the whole thing for a finished, artistic look. You can also just keep the raw material to make a wall composition, like this amazing ceramic tile wall art. Very easy to install, cheaper than art, and just as beautiful!